After bringing the Mi 8, Mi 8 Explorer Edition, and Mi 8 SE, Xiaomi is set to launch a new smartphone in the Mi 8 series in China on September 19. The Chinese manufacturer has confirmed the launch date of the upcoming smartphone, without revealing the name of the handset. However, rumour mills have been churning out reports of a smartphone, allegedly called Mi 8 Youth, in the last few weeks. Based on the official tears and previously leaked details, it is expected that the Mi 8 Youth will make its way to the market next week. It is also possible that the company will launch a smartphone called Xiaomi Mi 8X, which also has been a part of leaks, though it is quite unlikely. As per a teaser posted by Xiaomi on Chinese microblogging platform Weibo, the company has scheduled a launch event for September 19 in Chengdu, China. The image shows the number ‘8’ across the horizon of a city, which could possibly be a digital rendition of Chengdu. It also confirms that the smartphone belongs to the company’s Mi-Series and will launch next Wednesday. 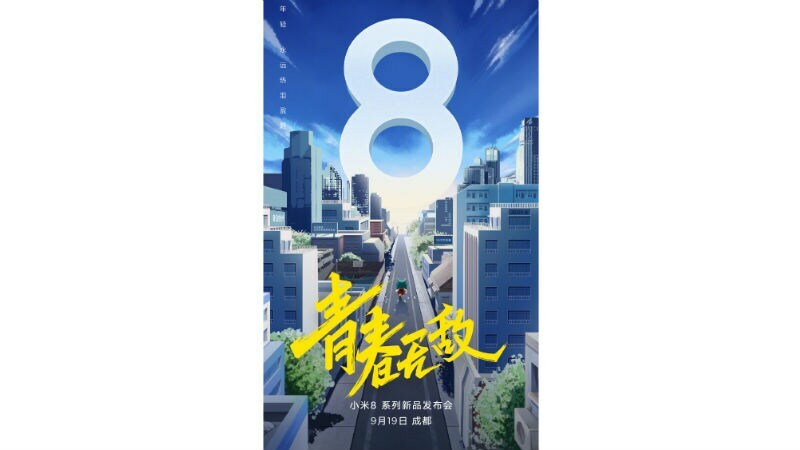 Interestingly, the design aesthetics of the teaser appears to be similar to another teaser that Xiaomi had posted earlier this week, hinting at the launch of Xiaomi Mi 8 Youth smartphone. Notably, a Xiaomi smartphone with model number M1808D2TE was earlier spotted on Chinese certification site TENAA. Additionally, specifications of the smartphone said to be the Mi 8 Youth, had also surfaced on Weibo. Though it is unlikely that the company will launch the Mi 8X next week, it is worth noting that this handset was also spotted in a leak. However, the leak had only showcased live images of the alleged Mi 8X, but the specifications of the smartphone were not revealed. Based on the leaked details, the Xiaomi Mi 8 Youth will come with a 3,250mAh battery, 4GB/ 6GB/ 8GB of RAM, Android 8.1 Oreo, 32GB/ 64GB/ 128GB of inbuilt storage, an octa-core SoC, 4G VoLTE, a dual rear camera setup with 4K support, and a rear-mounted fingerprint sensor. The leaked information had hinted at the presence of a 19:9 display with the possibility of a display notch on top. The phone is also expected to sport the latest Qualcomm Snapdragon 710 SoC under the hood.